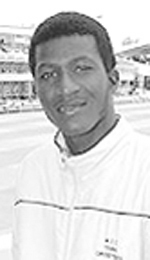 Darren Sammy, barely out of his teens and in his second summer as an MCC Young Cricketer, has recently had his childhood dream come true. âI had always dreamed of playing with Brian Lara ever since I was a little boy and now I can have that dream come true,â he tells BBC Sport. He had a chance with bat and ball in both matches against Ireland, taking 1-28 in seven overs in the match the West Indies won. He may even make the West Indiesâ starting line-up for their first match in the series on Saturday against New Zealand. Even if he does not, he should be encouraged by the West Indies Cricket Boardâs radical youth policy over the past four or five seasons. And all being well, he is set to become the first St. Lucian to play international cricket.